Enjoy Kruger National like never before with Viva Safari's bush walks. This is a brilliant opportunity to get really close to nature on foot. Guests may experience an acute adrenaline charge when in the presence of big five animals such as elephant, lion, rhino, and buffalo. You can also enjoy sunset drives on an open 4x4 land cruiser game drive. Stops will be made to photograph the stunning sunsets and to listen to the night sounds and admire the clear Southern hemisphere constellation. In this safari, you will stay at the Tremisana Game Lodge. The Tremisana Game Lodge is the largest and leading lodge in this section, having a total of 15 chalets plus a two-bedroom guesthouse. It can accommodate a maximum of 40 guests. Every unit has en-suite shower, toilet, and basin, and all are air-conditioned. Every bed has its own mosquito net. A 24-hour Wi-Fi is available to all Tremisana guests. The lodge is serviced by two excellent boreholes. Its proximity to the tar road means Tremisana is easily accessible all year round, including the rainy season. The presence of lions, elephant, and buffalo necessitates the maintaining of an electric fence around the camp. Perhaps the most striking feature of Tremisana Game Lodge is the beautiful gardens. The presence of numerous bougainvilleas and various palms and cycads gives the camp a subtropical feel. Water features add a soothing effect and the overall feel of Tremisana is very relaxing. At night, the subdued light from the illuminated paved walkways lends a romantic and magical flavor to this outstanding camp. Today, you will be picked up from your hotel in Gauteng or O. R. Tambo International Airport (JNB) and travel via the Highveld grasslands to Tremisana Game Lodge in the Kruger Park. Board an open land cruiser for a three-hour sunset drive, your first opportunity to experience the fauna and flora of Africa. Watch the magnificent African sunset and, after dark, use a spotlight to view nocturnal animals. Dinner in the Marula Tree Boma will be a bush braai. After dinner, continue with your night drive and overnight in en-suite air-conditioned chalets. At sunrise you will be driven to the Olifants River for a four-hour bush walk. Your rangers will show you many secrets of the bush. Adrenaline surges will be acute even if your rangers are adequately armed. You will return to Tremisana for brunch. Later, you may sleep in your air-conditioned chalet, swim, or read wildlife magazines in the lapa. A light lunch will be served, and at around 3:00 p.m., you will enjoy a four-hour drive on Balule. You will stop for sundowners and toast the splendor of Africa. Dinner and overnight will be at Tremisana. You will be driven to Kruger Park in your custom-built open-sided game viewer. You will game view without intervening glass windows, and also listen to and smell the denizens of the bush. The Orpen-Satara-Nwanedzi region has open plains that attract large herds of zebra, giraffe, and antelope that, in turn, attract many predators. In fact, this zone has the highest concentration of lions in Africa. After breakfast, you will be driven to Moholoholo Rehabilitation Centre. There, you will learn about the sterling work being done in rehabilitating injured and orphaned animals. You will get close and personal to some of the residents, including lions and leopards. Your understanding of wildlife conservation will be greatly improved. Return to Tremisana for a light lunch. At around 3:00 p.m., drive to Tshukudu Game Lodge. Enjoy a three-hour game drive in the enclosed big five reserve where the chances of seeing the big five are very good. You will return to Tremisana for dinner and overnight. Enjoy a sunrise drive before breakfast. Then you will be driven via the Panorama route to see the scenic splendors including the Three Rondawels and the Blyde Canyon. You will return to Gauteng in the late afternoon. Airport drop-off can be arranged as per your request. Bush walks are very popular as guests are afforded a brilliant opportunity to get really close to nature on foot. Guests may experience an acute adrenaline charge when in the presence of big five animals such as elephant, lion, rhino, and buffalo. Guests on the bush walks are always accompanied by two armed rangers. Although there is no legal limit to the minimum age of participants, Viva Safaris is informed by the recommendations of FGASA (Field Guides Association of S.A.). FGASA recommends that the minimum age be 16. Tourists aged between 12 and 16 may be permitted to participate in the bush walks as long as their parents take full responsibility in ensuring their children strictly obey all instructions from the rangers. Safaris conducted on nine-seater open game viewing vehicles. The open game viewers offer elevated vantage positions from where your game viewing and photographic opportunities are greatly enhanced. All game viewing vehicles are 4x4 conversions with access to all roads in all weather conditions. The Blyde River Canyon, including the Three Rondawels, is visited on the last day of the safari. The sunset game drive gives tourists their first opportunity of seeing Africa’s animals. A qualified guide will take you in an open 4x4 land cruiser game drive. Stops will be made to photograph the stunning sunsets and to listen to the night sounds and admire the clear Southern hemisphere constellation. Spotlights are used to locate elusive nocturnal animals. This safari will take place in Kruger National Park, Balule Nature Reserve, and Thsukudu Nature Reserve in South Africa. Breakfasts and dinners are included in the price as per itinerary. The bush braai is held on the first night of the safari. Viva Safaris has acquired a 20-hectare property deep in Balule, in fact over 10 kilometers from the main gate. A beautiful boma was built under a magnificent Marula Tree which protects tourists against elephants by a ring of sharp-edged rocks. It has a flush toilet and a wash hand basin. Armed rangers will patrol while you enjoy a bush braai in this remote piece of Africa. Please book your flight to arrive at O. R. Tambo International Airport (JNB). Transfer from and to the airport is included. Viva Safaris will pick you up from the airport. Transfer to and from Gauteng to the accommodation establishments are in air-conditioned Toyota Quantums. Viva Safaris offers you an excellent security as they conduct a door-to-door collection from your homes, hotels, hostels, or O. R. Tambo International Airport (JNB), thus ensuring your safety. 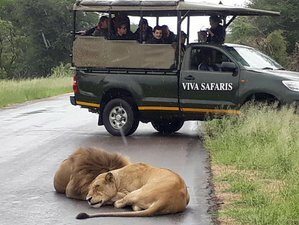 Viva Safaris is a leading South African tour operator offering fantastic value-for-money Kruger National Park safari packages and tours in open game vehicles. A standard indemnity form must be signed at the start of your safari.